JOURNEY * 45 * Just The Same Way / Somethin' To Hide * 1979 * NM USA ORIGINAL ! 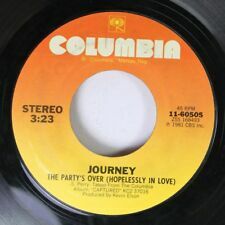 Journey Just The Same Way US Dj 12"
JOURNEY EVOLUTION LP FC 35797 W/ INNER, "JUST THE SAME WAY "
Journey "just the same way." single 7"or.hol.cbs:7207.de1979.